It’s officially spring in SA and the long, sunny days are back. For those living in Jo’burg it seems that you bypassed Spring altogether and jumped straight into Summer! The gorgeous hot weather is perfectly timed with National Braai Day on 24 September. Most South Africans will be spending the day outdoors with friends, basking in the sunshine and enjoying a lekker stukkie wors. I was looking for a new take on a traditional South African dessert for the occasion. It is Heritage Day after all. Peppermint Crisp Tart is a real South African favourite. It’s made by layering coconut biscuits, caramel, whipped cream and peppermint crisp chocolate. A fantastic crowd-pleaser that is sure to disappear quickly at any gathering! Let’s be honest though, there is nothing new about this dessert. By simply changing the cream for ice cream, you’ll take the original Peppermint Crisp Tart to a new level. 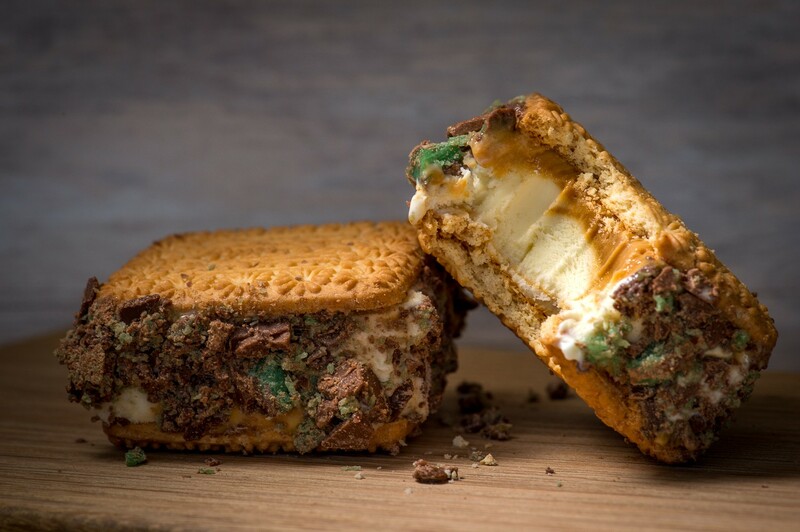 Still only 4 ingredients and very minimal effort required, but now you have beautiful, individual ice cream sandwiches that are just as delicious, and even more refreshing. A cool, creamy, crunchy, caramelly ending to a hot day in front of the braai! Allow the ice cream to soften at room temperature for 10-20 minutes or until it is spreadable. Spread it roughly into a rectangular tin, about 20cm x 30cm. Leave a few gaps for the caramel. Give the Caramel Treat a good stir until it is smooth. Dollop spoonfuls over the ice cream, and swirl together to create a marbled effect. 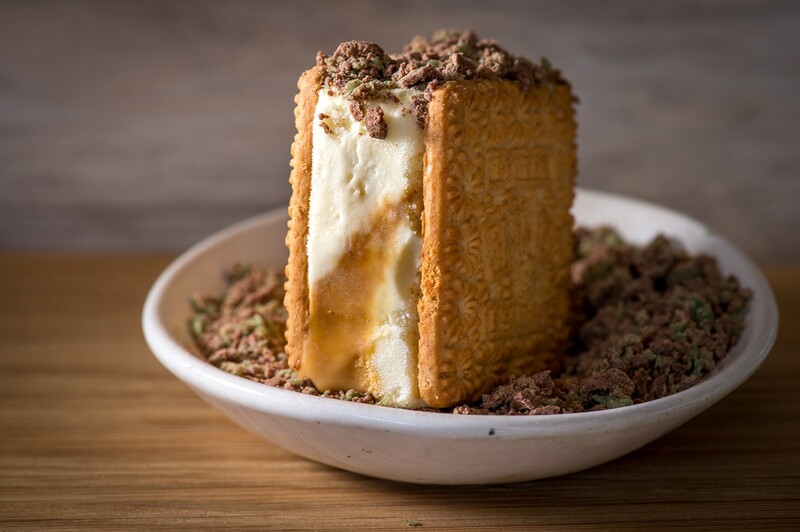 Using a Tennis Biscuit as a guide, cut squares of the ice cream mixture out and sandwich together with a Tennis Biscuit on each side. 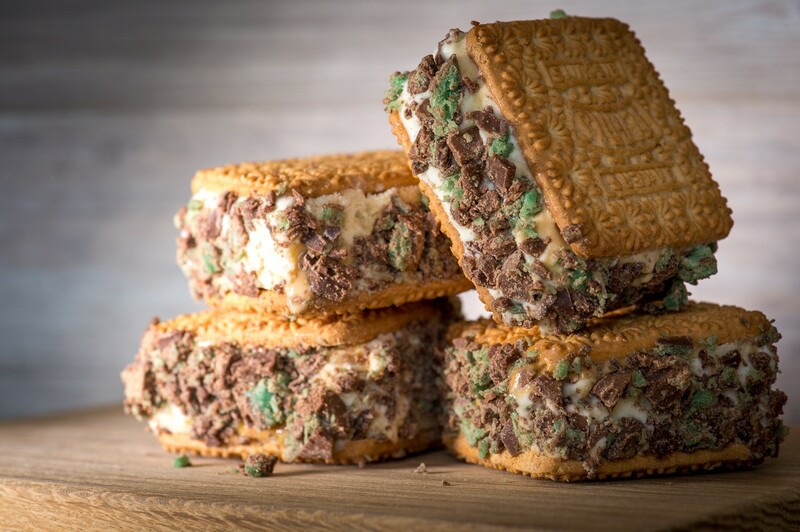 Roll the ice cream sandwich into the chopped Peppermint Crisp, coating all the edges. For more Peppermint Crisp Tart inspired treats click here and here.